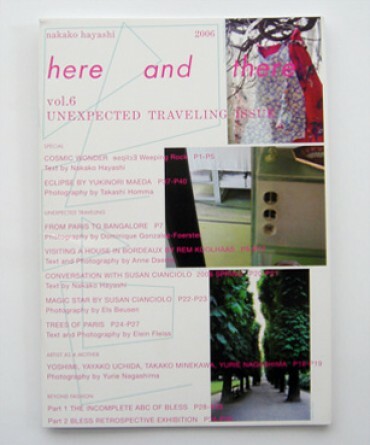 Here and There comes back, after two years of absence from the independent magazine scene, with Unexpected Travelling Issue, a sixth issue which counts already familiar but also new illustrious collaborations. In Nakako’s own words, the vision behind the Unexpected Travelling Issue was: "One day, someone told me her ideal garden is what looks like no one is taking care of, and have so many different pretty flowers in springtime. The other day my friend told me she has an ideal image of bringing up kids even though in reality she has to deal with daily life living in crowded Tokyo. I am into those stories, and new issue must be something related to this 'ideal' world. in each people's minds. Maybe you can talk about ideal books making"
With the sixth issue, Here and There consolidates its long-standing partnership with Nieves, which from now on will be publishing and distributing the magazine internationally. As Elein Fleiss once said, Here and There is the magazine of one person. The fact that Nakako's name is credited as the author on the cover is not an egocentric statement but reveals the spirit in which she makes it. Some people make films, others write books or make artworks, and Nakako makes a magazine. It is her personal work and in that sense she makes it in her own way, unlike most magazines on the planet. It also means she is free from capitalistic rules, from imposed trends, from the industry of fashion. Instead, she is free to follow her desire and to link the magazine with her personal life.